What’s that old saying about Mussolini? Say what you will but he made the trains run on time. Well, the suprachiasmatic nucleus — SCN for short — makes everything in the body run on time. The SCN is the control center for our internal genetic clock, the circadian rhythms which regulate everything from sleep to hunger, insulin sensitivity, hormone levels, body temperature, cell cycles and more. The SCN has been studied extensively but the underlying structure of its neural network has remained a mystery. 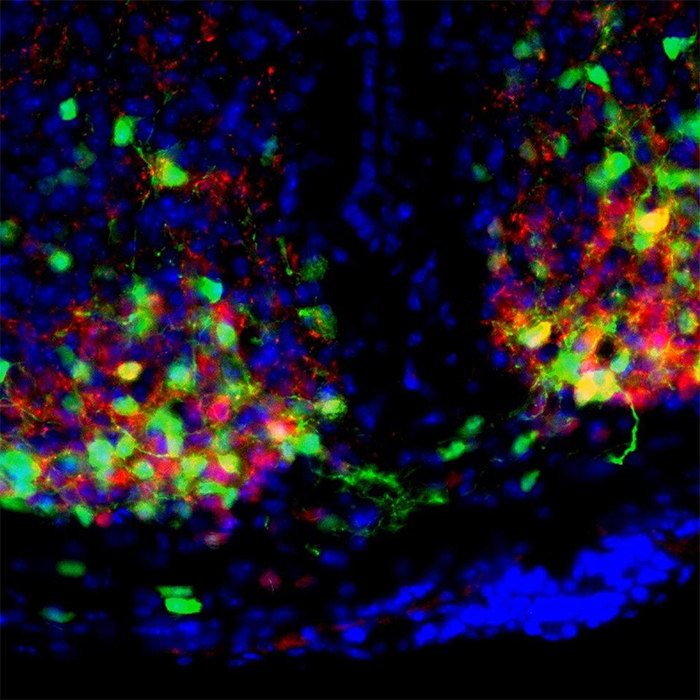 Now, researchers from the Harvard John A. Paulson School of Engineering and Applied Sciences (SEAS), the University of California Santa Barbara, and Washington University in St. Louis have shown for the first time how neurons in the SCN are connected to each other, shedding light on this vital area of the brain. Understanding this structure — and how it responds to disruption — is important for tackling illnesses like diabetes and posttraumatic stress disorder. The scientists have also found that disruption to these rhythms such as shifts in work schedules or blue light exposure at night can negatively impact overall health. The research was recently published in the Proceedings of the National Academies of Science (PNAS). The SCN looks like a miniature brain, with two hemispheres, inside the hypothalamus. It receives light cues from the retina to help it keep track of time and reset when necessary. When functioning properly, the neurons inside both hemispheres oscillate in a synchronized pattern. In order to understand the structure of the network, Abel and the team had to disrupt that pattern. The researchers used a potent neurotoxin commonly found in pufferfish to desynchronize the neurons in each hemisphere, turning the steady, rhythmic pulse of oscillations into a cacophony of disconnected beats. The team then removed the toxin and observed the network as it reestablished communication, using information theory to figure out which cells had to communicate to resynchronize the whole network. By observing the SCN at single-cell resolution, Abel and the team identified a core group of very friendly neurons in the center of each hemisphere that share a lot of information during resynchronization. They also observed dense connections between the hubs of each hemisphere. The neurons outside these central hubs, in the area called the shell, behaved more like acquaintances than friends, sharing little information amongst themselves. Previous research also assumed that the core SCN was dominant only due to its role in receiving light cues from the eyes. By using the neurotoxin to disrupt circadian rhythms, Abel and the team demonstrated that the core is the key to resynchronization even without light cues. The research was coauthored by Kirsten Meeker, Peter St. John, Benjamin Bales and Linda Petzold of UC Santa Barbara and Thomas Wang, Daniel Granados-Fuentes and Eric Herzog, of Washington University. It was funded by the National Institute of Health and the US Army Research Office.